One of the key signs of a government in distress is when the backstabbing, finger-pointing and accusations become public even as leaders struggle to maintain a façade of normalcy. For the Iranian regime, things are not looking so hot. 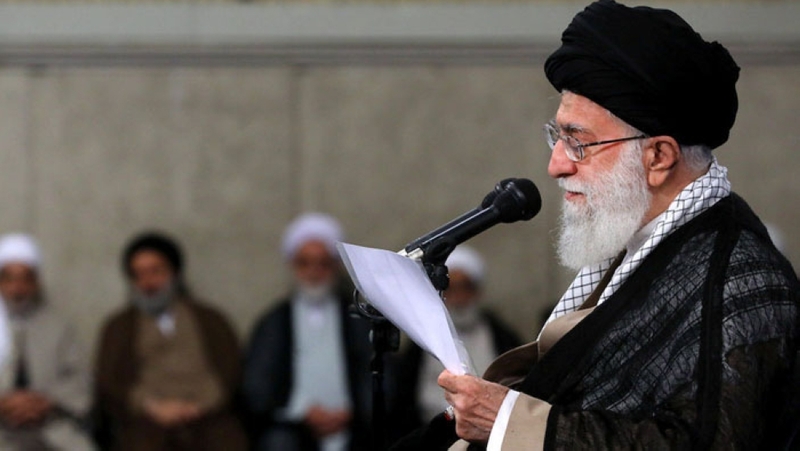 The regime’s top mullah, Ali Khamenei, is the latest to weigh in against the decision to negotiate the nuclear agreement with the U.S. and other world countries. An odd position to take since he gave his own blessing to the effort at the start of Hassan Rouhani’s new administration on the carefully honed public image that he would usher in a new era of moderation from Iran. But the regime’s leader, who rarely admits any mistakes from his divine perch, made comments this week that were posted on the Twitter account of Khat-e Hezbollah newspaper, a publication affiliated with his official website, Reuters reported. With the issue of the nuclear negotiations, I made a mistake in permitting our foreign minister to speak with them. It was a loss for us,” Khamenei said referring to the U.S.
Khamenei confirmed this week that he has banned any future discussions with the U.S. The tacit criticism of negotiating the deal, which President Donald Trump pulled out of and levied new economic sanctions that potentially will cripple the Iranian economy, drives a stake into the idea that Rouhani’s administration has been a success for the regime. Instead of the promised moderate era the Iran lobby, especially the National Iranian American Council touted, Rouhani has overseen Iran’s involvement in wars in Syria and Yemen, a major crackdown on political dissenters, a massive escalation in the use of the death penalty and a slumping economy due to rampant corruption and graft within his government. The new sanctions targeted Iranian purchases of U.S. dollars, metals trading, coal, industrial software and its auto sector, though the toughest measures targeting oil exports do not take effect for four more months; all areas more focused on the industrial sectors controlled by the regime through shell companies and state ownership of heavy industries. Rouhani himself was doing the best he could to backpedal from what is now becoming his greatest foreign policy failure in the nuclear deal. But the finger pointing is not likely to save Khamenei and the mullahs as the economy continues on a steep death spiral as evidenced by shocking economic news as Iran’s Minister of Industry, Mines and Business says, fluctuations in the local forex market in the past four months have tripled the number of applications for import licenses worth $250 billion dollar. Describing the figure as “unbelievable”, Mohammad Shariatmadari has insisted that a “number of” profiteering individuals are trying to “fish in troubled waters”, referring to the current currency and economic crisis. The figure of $250 billion is almost triple of Iran’s annual oil income according to Radio Farda. Import applications mean requests by importers to receive cheaper, subsidized dollars or other hard currencies from the government. Rouhani’s new forex policy, fixing the dollar’s official rate at 42,000 rials, encouraged scores of individuals and companies to apply for import licenses, receiving millions of subsidized dollars, bringing in goods into the country and sell them on the basis of dollar’s value in the non-governmental forex market, i.e. one dollar against more than 100,000 rials, thereby reaping a tidy profit. An example of this profiteering comes in the telecommunications market, an industry controlled by the regime’s Revolutionary Guard Corps, in which certain companies received foreign currency at the official subsidized rate of 42,000 rials to a single U.S. dollar to import cellphones and then turn around and sold them at the black-market rate of 100,000 rials to the dollar. It’s another example of the rampant corruption fostered by the mullahs and is enraging ordinary Iranians. Khamenei recognizes that anger among the Iranian people is reaching a critical point and poses one of the most significant threats to the mullahs’ rule in the history of the Islamic state, which is why he is casting about for scapegoats to divert attention from himself, be it blaming President Trump or Rouhani, the end game is to keep himself alive and in power. “More than the sanctions, economic mismanagement (by the government) is putting pressure on ordinary Iranians… I do not call it betrayal but a huge mistake in management,” state TV quoted Khamenei as saying as he tacitly accused Rouhani of doing little to curb mismanagement of the economy. The corruption and mismanagement by the ruling mullahs is so pervasive and unavoidable that even reliable Iran lobby cheerleaders such as Seyed Hossein Mousavian, a Princeton University “researcher” and former Iranian regime official even jumped on the bandwagon of criticisms. “The Iranian economy is under many, many difficulties like corruption, like dysfunctionality, like smuggling, like inflation and they have a lot of problems. This has been problem since 1979 when Saddam invaded Iran, Iran had eight years of war, and after war, the U.S. pushed for many, many sanctions against Iran. However, I believe at least 50 percent of the Iranian domestic economic problem is not because of the sanctions. They are because of the domestic dysfunctionality of different system, but this is the government or other system,” he said. “Therefore, if Iran is going to resist the sanctions, they would need to address the dysfunctionalities of their own system. Therefore, this is one reality about dysfunctionality of Iranian domestic economic system,” he added. With friends like these, it’s no wonder the mullahs are in full blame game mode.